Have you ever been in the situation to have only 30 minutes for preparing a decent dinner? I bet you did. I was there several times :). I don’t know what saved you from the “situation” but for me one of the easy/quick – 30 minutes dinner is a variation of pasta and tomato sauce; of course with a vegetable addition, if on hand : mushrooms, artichoke, asparagus, capers, olives …whatever you like or have on cupboard. 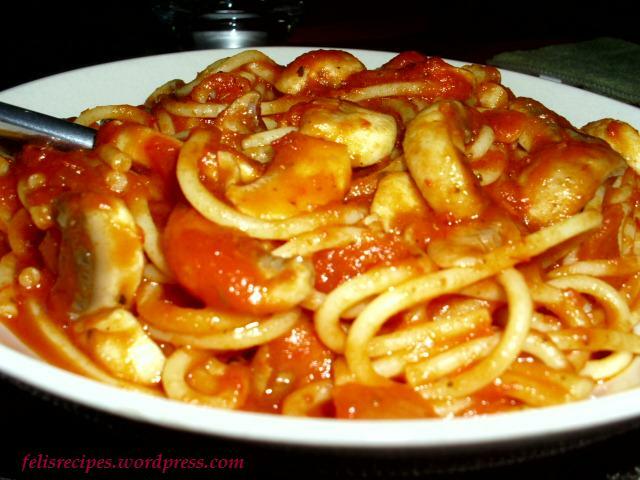 So, this time I had : spaghettoni, mushroom-tomato sauce, fresh mushrooms ! Prepare the pasta after package information. Drain the pasta and wash it in cool water. In a large pan heat 3 tbsp of olive oil. Add the garlic and mushrooms and cook for about 5 minutes. Add the mushroom tomato sauce, crashed tomato and turn down the heat to low. Season with salt and pepper and dried oregano and cook for 5 more minutes. Add the pasta and lightly toss them together.